The agile approach works even in the enterprise. Our projects include teaching you SCRUM and training on using the Atlassian product portfolio in action. Using the latest technologies to build enterprise grade applications. Our code always goes through rigid user acceptance tests, load tests and internal analytical tests. Bringing operations closer to development. Build and deployment processes, configuration files are always created together. Docker container based technologies are used in our development environments and thanks to its scalability we also use them in integration testing and production environments. Most of our services run in the Amazon cloud. Using Atlassian Bamboo to manage integrated deployment processes we can easily deploy to production several times a day. Knowing that our code base is always covered 100% with unit tests gives us enourmous security. Adding new functions takes place much faster and with less errors. Implemented SCRUM in many of our enterprise projects and held agile training at KÜRT Academy. Besides consulting our main focus is also on introducing the Atlassian agile software portfolio. Active Vision has been playing a dominant role on the Hungarian eCMS and behavior driven online solutions market for more than a decade. Our widely known products, services and solutions offer incomparable solutions due to constant research and development. Our Hungarian and international clientele include leading companies such as OTP Bank Group, Erste Bank, ING Group, GDF Suez, Sanoma, Signal Insurance and Allianz Hungary. 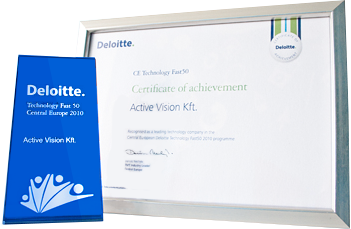 Active Vision has been listed as the fastest growing Hungarian technology company in 2011 on Deloitte's "Fast 50" list. SHIWA 7 is a web content management system primarily for enterprises (eCMS – enterprise content management system). Its simple yet strict user interface offers professional online content editing features for internet, intranet and extranet (external business partner networks) environments as well. Adpoting to the ever chnaging world of business Shiwa 7 offers a long term solution to manage online business content based on the company's style guides. 1123 Budapest, Alkotás utca 17-19. Déli Point building floor 7. 2010-2017 © All rights reserved!